photo courtesy ZooMed Welcome to kingsnake.com's classified section for prepared and prepackaged foods for reptiles & amphibians. This section is for posting wanted and for sale advertisements for prepared and prepackaged things to be eaten/consumed as food by reptiles and amphibians, such as dry kibble, and canned foods, or fresh or dried produce. 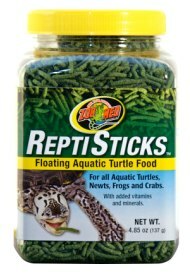 Today there are a wide variety of pre-made and pre-packaged food available for a number of reptiles and amphibians. Specialized diets exist for turtles, tortoises, monitor lizards, geckos and more, and are often used to supplement live foods and fresh vegetables in an animals diet. If you are looking for, or want to post advertisements for, items other than repared and prepackaged foods please review our classified index for the appropriate category. For questions on feeding your animals please check out our Forums, or to look at photos, visit the Photo Gallery.